Fan mail #1: The listener is second grade middle schooler whose hobby is baseball. He asks the hosts what their favorite positions in the game are. Gaki-san asked one of her managers to explain to her about the game so the two could answer the question properly. While she was at it, she asked what he thought their positions should be. The manager thinks Gaki-san would make for a good catcher as it’s a position where you can see the whole playing field. Kame, he thinks, would probably be a right fielder — not many balls end up all the way back there so it wouldn’t matter even if she was just spacing off most of the time. Kame says she’s later going to harass the manager in question with incessant phone calls. Song: Morning Musume – Genki Pikappika! Fan mail #1: The listener has something they say they “reeeeeeeeeeeeeally” must tell our hosts. Kame: (as listener:) “Niigaki Risa-san… Kamei Eri-san… suki dasu. Oh, wait. I made a mistake. I mean: suki desu. Phew, feels good getting it off my chest.” Well, what do you think Gaki-san? Your answer? We were confessed to just now! Gaki-san: Um… Does this person not kind of resemble you? Kame: Why do you say that? That aside, the hosts are thankful — they agree it feels good to be told you’re liked. Kame says her heart is filled with love. 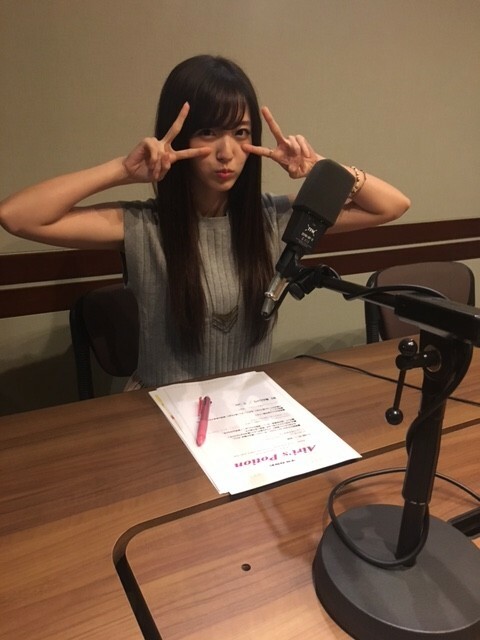 Airi also reads out a message from a listener who enjoys Airi’s easy-on-the ears voice. The listener also went through a period when they were very much into BoA-san. This was probably about the same time as Airi, as the listener often enjoyed listening to Kimochi ha Tsutawaru. That obsession over BoA-san led the listener to start thinking about studying Korean back then, though the only thing that remains now is a love of spicy foods. On the topic of BoA-san, besides Airi’s recent choice of Kimochi ha Tsutawaru, Airi also enjoyed BoA-san’s earlier songs such as Amazing Kiss. She also listens a lot to BoA-san’s recent dance numbers, and she’s looking forward to more appearances by BoA-san. Airi’s never before got a message where someone sympathises with her song selection, so she’s pretty happy. The feeling of how this programme feels like it’s being built together with the listeners is something that she enjoys.